This is my own personal blog, each article is an XML document and the code powering it is hand cranked in XQuery and XSLT. It is fairly simple and has evolved only as I have needed additional functionality. I plan to Open Source the code once it is a bit more mature, however if you would like a copy in the meantime drop me a line. I have a small NAS which I have built which run's OpenIndiana oi_151 and I wanted to be able to headlessly administer it, whilst I have SSH and thats all I really need, sometimes its nice to use a remote desktop environment. XDMCP is a fundamental part of the X Window System, and one feature it offers is the ability to export your display across a network. It is possible to configure your OpenIndiana system to operate as a file server for your Mac using the AFP protocol, and if you have lots of lovely ZFS storage attached then it makes lots of sense. 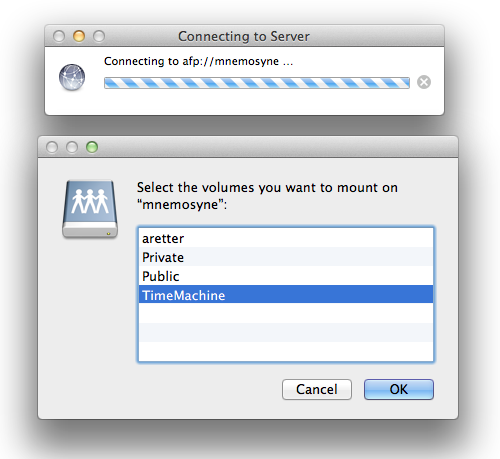 You can also configure OpenIndiana to act as as Time Capsule for your Mac's Time Machine! The instructions below relate to OpenIndiana oi_151, and Apple Mac OSX Snow Leopard, however the procedure is probably much the same for all OpenIndiana versions. The Time Machine configuration does not work yet for Apple Mac OSX Lion, when I figure this out I will post the details. If you have different requirements for different Users then you can copy /usr/local/etc/netatalk/AppleVolumes.default to a Users home folder as AppleVolumes or .AppleVolumes and override the share settings for the user there. You should now mount your Time Machine share through the Finder by clicking Go -> Connect to Server... Entering afp://your-openindiana-hostname-here and then selecting the 'TimeMachine' share. You now need to copy the above Image file that you created to the mounted share. 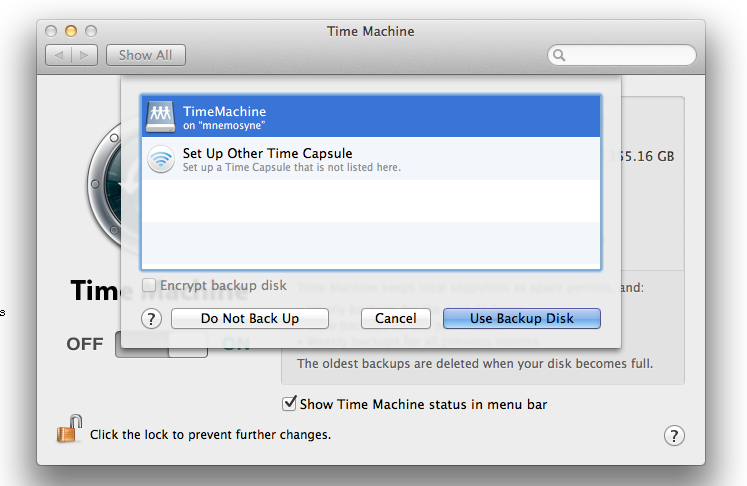 You can now launch TimeMachine, click 'Select Disk', wait for the mounted 'TimeMachine' share to appear and then click 'Use Backup Disk'. I have been hosting my own websites for a couple of years now with a company called Entic.net. Entic.net offer Solaris hosting, by providing full VPS's (Virtual Private Server's) via Solaris Zones technology, they are a great little company with excellent personal support. I am so happy with their service and assistance over the last couple of years, that I really feel I have to sing their praises in public! I originally started out with Entic.net in mid 2008, when I was looking for affordable Solaris 10 hosting after doing some benchmarking with an eXist-db application and discovering that the best performance was achieved when running atop Solaris 10. Entic.net were at that time able to provide me with a Sun Solaris 10 VPS (curd.entic.net) for just $20 USD/month. Whilst it was located in their US San Jose data center and I am in the UK, I decided that the geographical location did not really matter to me, after all we are both connected to the web! In June 2009 they assisted me (at no charge!) in migrating to an Open Solaris VPS (well.entic.net) again still at $20 USD/month, for someone who also spends a lot of time in Linux, the move to Open Solaris made server admin much easier - due to the integration of more GNU tools when compared to its predecessor. As I am an incurable technology junkie, and had been wondering about where to go from Open Solaris now that Oracle have taken over, I contacted Entic.net and enquired about their plans. To my joy I found out that they were already operating some Open Indiana servers and would be more than happy to help me migrate (again at no charge!) if I so wished. I also learnt that Entic.net had expanded and now also have a London data center, and that I could choose to have VPS's located in either. 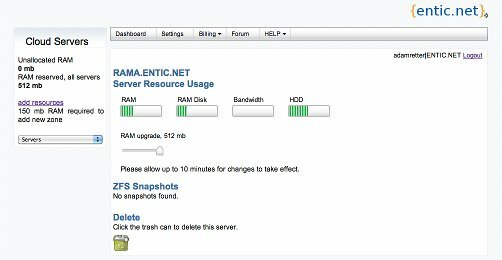 I jumped at the chance, so Entic.net (well actually, I did it via their self-service web dashboard) setup a new Open Indiana VPS (rama.entic.net), in parallel to my existing VPS and allowed me to migrate in my own time. I decided to locate my new VPS in London, im not sure why, but it felt right. I also took the opportunity to increase the memory available to my VPS, taking the cost from $20/month USD to $31 USD/month total, but thats still cheap! Increasing the memory is again completely automated via their self-service web dashboard, changes take effect within minutes, and without needing to reboot the VPS! So... I now have my shiny new Open Indiana Web Server up and running, I am of course running eXist-db and Nginx on here, and so far it all seems fast and stable. I may consider a follow up article detailing the steps to setup eXist-db and Nginx on Open Indiana if there is enough interest. ...and, a big thank you to everyone at Entic.net for your excellent service and support, Cheers!